Hospitality Biz welcomes applications from dedicated and competent journalists with a penchant for growth. Reporters: Atleast one year of experience at a reputed media house. Work experience with Hospitality/Travel as a beat will be preferred. Chief Reporter: Atleast five years of experience at known media houses. Hospitality/Travel as a beat would be preferred. 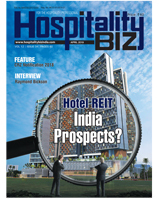 Hospitality Biz is a fortnightly news & analysis magazine reporting on and for the Indian hospitality industry. Presented in a crisp format, the magazine has a holistic focus to streamline industry-relevant news and analysis. Hospitality Biz magazine will combine a range of current news stories across each of the industry’s verticals, backed by analysis and perspective. It will also feature dedicated sections for trend and strategy analysis. Saffron Media Pvt. Ltd, a division of the Adfactors Group, is an independent media company headquartered in Mumbai, India. Saffron Media focuses primarily on print and online communications. The company's portfolio includes publications in the life sciences group (pharmaceuticals and healthcare), capital expenditure, research, food & beverage, travel and hospitality sectors across South-East Asia, the Middle East and Europe. Saffron Media has offices in India, Sri Lanka, Dubai, Singapore and London. Receive the best of Hospitality content in your mailbox.